When I first signed up for February’s Rodeo Run, I think I took for granted the theory that if I can run a 5K, I can easily run a 10K. That theory is both stupid and dangerous, as it could easily lead me to injuring myself. And that would be a very.bad.thing. So, just as I did with Couch-to-5K as a means of getting myself up to running 3.1 miles, I’m using a training program to get myself up to running 6.2. 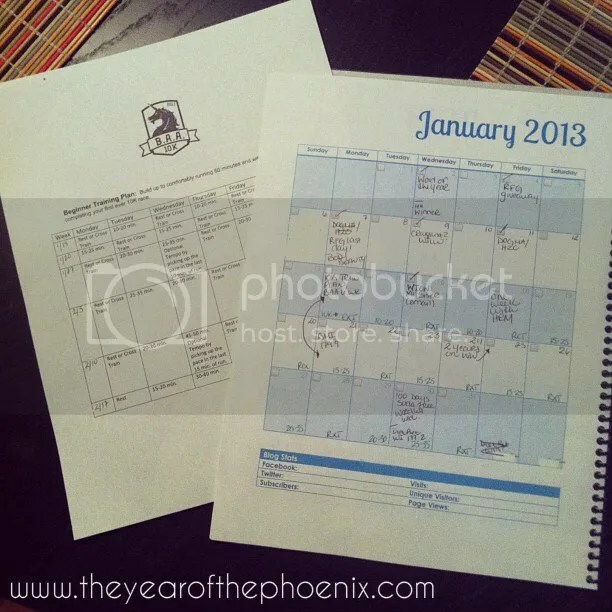 After looking around the ol’ interwebs, I settled on the 6 Week Beginner Schedule put forth by the Boston Athletic Association, and not only printed out the schedule but put it in my blog planner. Figured I can trust the people behind the Boston Marathon. has a second page for post ideas, To Do list, email correspondence, etc. There are three reasons I liked this schedule above the others I looked at: A) Mondays are rest or cross training days. I don’t know about you, but I don’t do well waking up earlier than necessary on a Monday so having the option to not have to do that or just cross train in the comfort of my apartment is perfect. Only Monday that required a run is, conveniently, today which is a holiday. II) Saturdays are cross training days, which is good since that’s when I have yoga and I don’t want to have to shift a program’s days unless I absolutely have to. 3) While I will have to do some running before work, the time frames they’ve laid out are very doable with my schedule. Like most beginner training schedules, this is designed with the final goal of merely completing the race, not necessarily with a specific finish time. The program is conditioning you and your body to running for a certain length of time, building up your endurance. If I can finish in under an hour and a half, I’ll be very happy. For cross training I’ve started using kettlebells and I am in love. I don’t do lifting or strength training, I’m a cardio gal. But I also know that adding weights to my routine can only be beneficial and I’ve heard lots of positive things about kettlebells so I decided to give them a go-go and I am so glad I did. Because they are working out muscles my body isn’t used to utilizing, each session leaves me sore. But it’s that good kind of sore, y’know? The kind that makes you go back for more. Plus, Sissy’s wedding is at the end of June and I’m going to be wearing a sleeveless dress. Five months of twice weekly kettlebells and I may have me some buffed out arms to show off. Have you used any sort of training program for running? Next posttwo years down. a lifetime left to go. Oh cool, thanks for letting me know! You have developed a well rounded program. I hate lifting, but can run any day of the week. Did you see the photo going around fb of the comparison of the volume of fat vs muscle for the same weight? I know the importance of lifting, I just hate doing it. I can't wait to hear about your training. I did a plan for a half marathon (Hal Higdon). I will say it was good to have a plan…and I finished the half…but it wasn't easy. I'm not really a fan of lifting either, but I've found if I do it while watching something on TV it helps make the time go faster. My half training will start in July so we'll see how that goes! Luckily I'll be able to run outside and not always on the treadmill. And yes, kettlebells are amazing! Totally in love with them and happy I gave them a chance.